An unbroken stand of 52 between Andy Balbirnie and Alex Cusack earned Ireland a three-wicket win in their tri-series opener against Afghanistan. Afghanistan were bowled out for 180 in Dubai, with left-arm spinner George Dockrell taking an impressive 4-35. 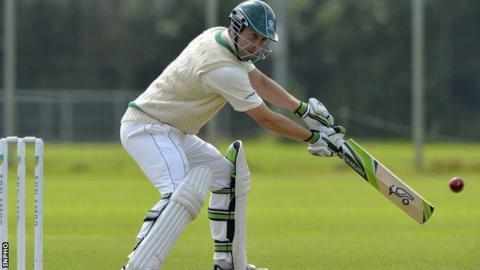 Ed Joyce hit 51 in Ireland's reply but they were struggling on 129-7 before Balbirnie (31) and Cusack (26) won it with nearly seven overs to spare. Ireland next take on Scotland in the tri-series at the same venue on Monday. Dockrell claimed 4-35 after Ireland asked the Afghans to bat first, with opener Javed Ahmadi (81) their top scorer. But he lacked support, with Najibullah Zadran (45) the only other man to score more than 12, and wickets fell at regular intervals as Afghanistan were dismissed for a modest 180 in 44.2 overs. John Mooney (2-36), Kevin O'Brien (1-27), Craig Young (1-18), Cusack (1-22) and Balbirnie (1-26) were the other wicket takers. Joyce shared a stand of 44 with Niall O'Brien (22) after the early wickets of Paul Stirling, William Porterfield and Gary Wilson. Kevin O'Brien impressed with a typically breezy 30 from 35 balls, including the only six of the innings, and in the process overtook Porterfield to become Ireland's leading run scorer in ODIs on 2,144. O'Brien's dismissal, followed two balls later by John Mooney, had the Irish in deep trouble before Balbirnie and Cusack's salvage mission. The series is preparation for the World Cup, which starts next month with Ireland's first match against West Indies in Nelson, New Zealand on 16 February.